← The Stressed Stone is now Super! I was looking through some photos of storm Doris in action and I noticed the two plants in this picture. They were planted at the same time and have received the same care but they look very different. What can we learn from this parable of the plants? Believe it or not, the structure that the plants are either side of is a rabbit run. 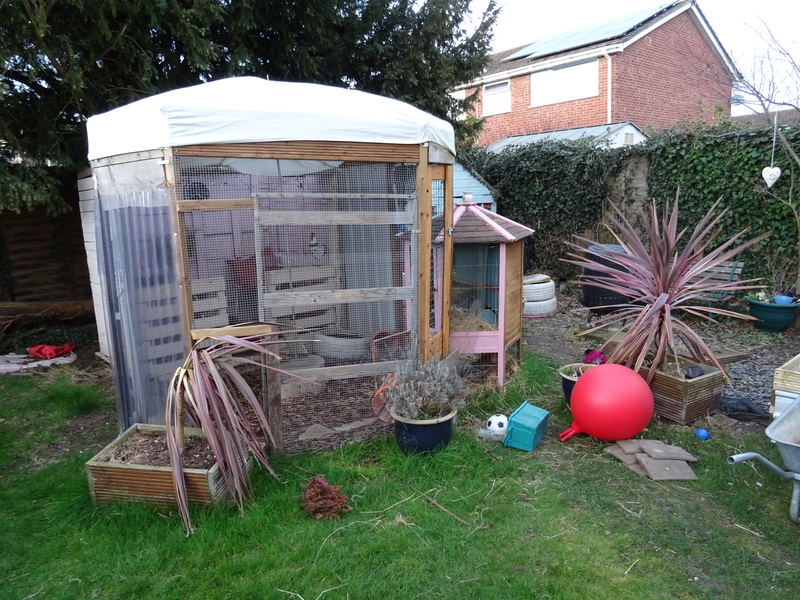 The reason it is so big is that Tracey decided to build something big enough for her to go inside comfortably so that she can spend time with her rabbits. The reason that the plant on the left is looking less than healthy is that when the wind blows them, sometimes the leaves brush the edge of the run and the rabbits then nibble at them. Yesterday I was trying to take a picture of the canopy on top of the run being blown about but the end result led me to notice how destructive our rabbits are. The two plants remind me of something that is really important in life. We can only take so many attacks and criticisms before we begin to fade. Take some time to think about the things that pull you down. Is there a way to avoid any of these things? Take some time to think about the things that build us up. Is there any way of opening ourselves up to more of these opportunities? I think that the plant that has been savaged by our Rabbits is done for but I give thanks that God can restore and mend our lives no matter how much that we have been damaged. You can read more about the things that build us up and tear us down as well as how God restores in Life is like a game of Jenga. This entry was posted in encouragement, Faith, Life experiences, Life in all it's fullness, Treat one another the way you want to be treated and tagged building one another up, building up or tearing down, encourage, encourage one another, encouragement, what are we building on, who can you encourage?. Bookmark the permalink.